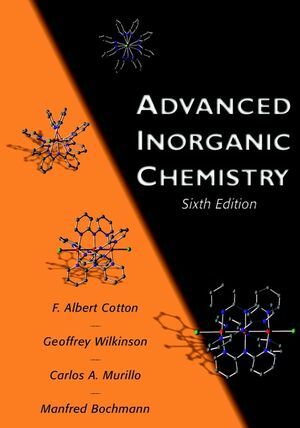 For more than a quarter century, Cotton and Wilkinson's Advanced Inorganic Chemistry has been the source that students and professional chemists have turned to for the background needed to understand current research literature in inorganic chemistry and aspects of organometallic chemistry. Like its predecessors, this updated Sixth Edition is organized around the periodic table of elements and provides a systematic treatment of the chemistry of all chemical elements and their compounds. It incorporates important recent developments with an emphasis on advances in the interpretation of structure, bonding, and reactivity. * "The first place to go when seeking general information about the chemistry of a particular element, especially when up-to-date, authoritative information is desired." -Journal of the American Chemical Society. * "Every student with a serious interest in inorganic chemistry should have [this book]." -Journal of Chemical Education. * "A mine of information . . . an invaluable guide." -Nature. * "The standard by which all other inorganic chemistry books are judged. "-Nouveau Journal de Chimie. * "A masterly overview of the chemistry of the elements. "-The Times of London Higher Education Supplement. * "A bonanza of information on important results and developments which could otherwise easily be overlooked in the general deluge of publications." -Angewandte Chemie. THE CHEMISTRY OF THE MAIN GROUP ELEMENTS. The Group 1 Elements: Li, Na, K, Rb, Cs, Fr. The Group 2 Elements: Be, Mg, Ca, Sr, Ba, Ra. The Group 13 Elements: Al, Ga, In, Tl. The Group 14 Elements: Si, Ge, Sn, Pb. The Group 15 Elements: P, As, Sb, Bi. The Group 16 Elements: S, Se, Te, Po. The Group 17 Elements: F, CI, Br, I, At. The Group 18 Elements: He, Ne, Ar, Kr, Xe, Rn. The Group 12 Elements: Zn, Cd, Hg. THE CHEMISRTY OF THE TRANSITION ELEMENTS. Survey of the Transition Elements. The Elements of the First Transition Series. The Elements of the Second and Third Transition Series. The Group 3 Elements and the Lanthanides. THE ROLE OF ORGANOMETALLIC CHEMISTRY IN CATALYSIS. Fundamental Reactions Steps of Transition Metal Catalyzed Reaction. Homogeneous Catalysis by Transition Metal Complexes. F. ALBERT COTTON, PhD, is a professor in the Department of Chemistry at Texas A&M University. SIR GEOFFREY WILKINSON, PhD (deceased), was a professor in the Department of Chemistry at the Imperial College of Science, Technology, and Medicine in London, United Kingdom. CARLOS A. MURILLO, PhD, is a professor in the Department of Chemistry at the University of Costa Rica and an adjunct pro- fessor in the Department of Chemistry at Texas A&M University. MANFRED BOCHMANN, PhD, is a professor in the School of Chemistry at the University of Leeds, United Kingdom. Buy Both and Save 25%! Cannot be combined with any other offers. Learn more. Prices are valid for United States. Change location to view local pricing and availability. To apply for permission please send your request to permissions@wiley.com with specific details of your requirements. This should include, the Wiley title(s), and the specific portion of the content you wish to re-use (e.g figure, table, text extract, chapter, page numbers etc), the way in which you wish to re-use it, the circulation/print run/number of people who will have access to the content and whether this is for commercial or academic purposes. If this is a republication request please include details of the new work in which the Wiley content will appear. An email confirmation has been sent to you. Learn about the latest products, events, offers and content. You are now subscribed to our email alert for Accounting Technology. Copyright © 2000-2017 by John Wiley & Sons, Inc., or related companies. All rights reserved.